I teach "The Rubaiyat" to my World Literature class. I LOVE IT. I love introducing students to poetry from so far away and so long ago that still has messages for today. However, it is an older poem that takes a bit of work interpreting, and for many of my transfer and exchange students, it serves as their first official poetry lesson. So, before we jump into the world of Persian Poetry, we start with something a bit easier: Bon Jovi's, "It's My Life." My class experiencing Bon Jovi. Despite being so old there's a pager in the music video, students really like this song! Plus the message is very similar to The Rubaiyat, and it's filled with figurative language. We start by watching the music video and talking about what the "plot" is. Then we review literary devices and on their own students find as many of them as they can. Ater five minutes I let them pair up to compare and share. Finally, ONE of them gets out a computer, and they head to Prism and create an account. 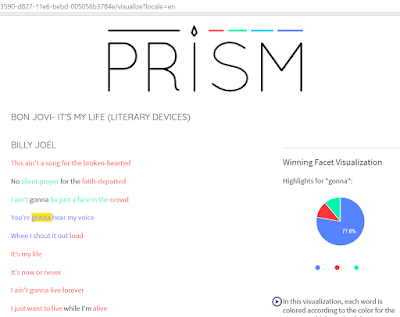 Then I share this link where I uploaded the lyrics to the song and picked three different categories. You could make these whatever you wanted. I've done this with connotation (positive, neutral, negative) and literal vs. figurative language. After a quick demo, where I show students how to highlight, erase, and switch highlighters, they are on their own! I have them go through the poem. With a partner, they decide what color different sentences and phrases need to be highlighted. In this case, I made it a little tricky. I didn't just mark things metaphors or similes I moved those into different categories (figurative language, clever writing, word choice). This meant with some things (like allusions) they had to figure out where it fit best. Once they finish they click "Save highlights." In the end, you can show the visual representation of what everyone marked. It highlights the words according to the majority. So you can see in the example that gonna is marked as figurative language by most students. However, some marked it for word choice and some clever writing. This provides a great visualization and allows us to discuss this as a class, which we did. Students pointed out that gonna was a great example of informal diction making this a very informal. Now, some teachers consider a flaw of PRISM to be that you can't see what each student did individually. That's true! If you really want to see what each student did you can have them screen shot their page and submit that to you, but I care more about the quality of conversations they have with their partner. So more than needing to see what they highlighted, I walk around and make note of their discussions. How cool — I've never heard of Prism before. Looks so fun and engaging! Every time I get to the point where I think I know all the cool sites, someone shares something new with me! This is great. A friend is student teaching now and used it for an observation. She said her mentor teacher commented, "I don't like technology for the sake of technology, but this was an excellent use of the chromebooks to take the activity to a different level."